172 p. : ill. (1 col.) ; 23 cm. 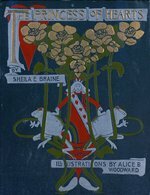 by Sheila E. Braine ; illustrated by Alice B. Woodward. "The bridegroom stood like a statue" . and their backs turned to the beautiful sunlight? upsetting to a literary man. of them knew what they were talking about. are more important than others. Frog-Duchess," returned her consort firmly. dearest life, is greatly to be wished." bouquet, and laid it in the Princess's cradle. Princess luck. It is true, true, true!" hideous voices they have!" thought the Queen. she smiled and muttered something to herself. her train out of the mud. nobody knew why, but it had always been so. talked about for the rest of the year. Hearts sounded both sweet and suitable. Princess, this is truly the shabbiest!" of spoons in a case." meant by it, I wonder?" do this quite as well as any ordinary woman. "Very extraordinary of the Frog-Duchess!" his respects to the Princess. manner. The Ambassador retired in a huff. Fortunately such accidents did not often occur. lost all his private pupils too. she was allowed to have her dolls with her. who had a sweetly intelligent expression. "But I am sure they listen most attentively,"
said Joan consolingly to her professors. them, and play with them for hours together. tion which might mean anything you liked. tant dish-washers. And I will go myself,"
one of you, and be quick about it." 0 keep you all well there! O keep you all well there." Which was very invigorating and exciting. the Princess was the grubbiest of all. get that she was a princess. stockings?" asked the Crown Prince, giggling. sister's eye, he became quickly serious. "I say, darling," cried Jack, don't cry. came in, it wouldn't seem half so bad." Joan brightened up at this. remarkable toilette, assisted by her small ladies. that Joan of Hearts isn't lost any more." a down like so many moon-daisies. a running comment of Pshaws!" and H'ms!" sense!" or Not a word of truth in it!" man, who, after all, was merely doing his duty. heard for the screeching of the birds. head in his golden hoop to express his triumph. son's hand in marriage for his daughter Cylindra. your list of eligible princesses by accident?" spoke in a faint voice. "She squints with the left eye." "And she has two long front teeth." older than our dear, dear Jack. Oh, oh, oh!" terrier, Blinkie, where you bury your bones. them up. See if I don't!" away, and took service with a sweep. had come into her mind. is beyond the strength of our, armies?" "To fight him, no; but to beat him, yes. sire? I have a plan in my head." he did not look particularly hopeful. her fellow-servants Griselda the Impatient. to show there was no ill-feeling. gotten her and her strange uncanny powers. the recipe, How to Smother an old Rabbit". the Queen had taken in coming into her kitchen. Tower of the Four Winds, across the moor." it?" The Queen's face fell several inches. never find the way at this time of night. But-"
that your wages really ought to be doubled." when I'd a fancy to." will take you to the Tower of the Four Winds. jesty? 'Horse and Hattock', three times over." No, I sha'n't forget it," answered the Queen. she would ever get back alive. start before I have time to be frightened. habitants as the one she lived in down below. "But how could you know I was coming?" the White Grand-daddy told him." a state of mind. I have come to you for help. Do you live all alone in this Tower, child?" mer. Nobody can say they are overcharged. deal while you are asleep." "This is my Double-Uncle, your Majesty." and all kinds of queer machines and instruments. It was rather an alarming sort of room. at the placid figure of Griselda's relative. Not when you know as much as he does,"
replied the girl, gazing at the sleeper respectfully. own room, if you will follow me." as if it were a wedding-cake," cried the Queen. pentagram is a star with five points. wizard, and commenced to read at haphazard. gram, for she knew not what. Nothing at alll" answered the Queen. pered once more "Can you see anything?" Nothing at all," repeated the Queen.. The light burned a deep orange. a cavern, and flames issuing from it. was ready to swoon with terror. and the air seemed full of glittering serpents. all wriggling and twining together. Queen sank down and hid her face. questions, as my Double-Uncle can." "And very glad I am that you couldn't,"
Griselda, I think I will go home." what he advises about the Crown Prince?" me how to get home again, Griselda?" middle, where the hawk's bit of meat was stuck. it, and said so in unmistakable language. goes Master Hawk after him. "You are a tiresome and untutored bird!" will get out into the world again." and desolate it seemed where he was standing! merry.splash of a water-rat diving off the bank. weird shadows, the reeds hardly swayed. Crown Prince, shivering in spite of himself. weight, and yet I feel strangely tempted to try." go on dancing until he dropped down dead. the elves had gone off into a fit of laughter. second foot quickly followed its brother. young hero stepping bravely over the marsh. "What is the use of that?" asked the Prince. said I had better strike out a line for myself. So I decided to take up extinct animals." "And have you found any to take up, Mr.
No, I am afraid I do not," answered Jack. "Appearances are deceptive," said the Crane. finding an extinct animal. Good-day to you!" get round the hedge on the other side. hear the words quite plainly. And so my story is told." mured Jack, and his heart gave a great thump. funny; I didn't see that before!" locked. "The song says he found the key. the point, if hardly grammatical. to see what was inside the Marybud hedge. he could only find that key! from between the bars as best he might. My warrior blithe and bold ". old pedlar with a pack on his back. such as young folks fancy?" "Go in a good hour," returned the Prince. And so my story is told". disguise, he would, perhaps, have hurried on. song you were singing just now?" I desired to show you." overpowering desire to possess it. The answer was an unexpected one. will give you no trouble at all." "Your wits must be gone wool-gathering,"
gives you quite as much pain as pleasure." THE King's idea was rather a risky one. here in time," objected the Queen. daughter will consolidate the empire." by a guard of honour. cried, in no very amiable tone of voice. her principal means of subsistence? Yah! them loftily, "we have other fish to fry." "Then what are you doing in my cellar?" that again about the Crown Prince!" let us dissemble our indignation." the King shall pay for this." the exact places where he had to be prompted. parents and consolidate the empire." eyes, and curling their leaves for joy and delight. chanted, "we know, we know, we know!" "How merry you are, my marsh children!" married to the Crown Prince to-day." will remember to shine upon the bride." we are happy, we wink, wink, wink." "And when you are unhappy?" the light, and thought it altogether a mistake. deny that that might be true. rapscallion, that I detest scent." The trembling page fell upon his knees. Prince's wedding-day. But don't do it again. all right, my dear, don't you alarm yourself. Ah, there goes the cannon!" strangely indifferent to what was going forward. was annoyed at being wedded in this hurry. impossible to say in the least what she was like. repeated listlessly what he was told to say. fellow must have something on his mind." we behold the blushing bride?" It is for the Crown Prince to raise her veil." exclaimed angrily; "what are you dreaming of? her permission to raise her veil." Jack in a tone of hopeless indifference. to be!" said the Cat, peeping from under a chair. "I would not have missed this for a fat rat!" "But consider, my good lady, consider-"
been deeply insulted. Jack of Hearts, forsooth! child. Is my carriage there?" thus? You will break all our hearts." "He must, indeed, be out of his mind,"
exclaimed the Queen, in the deepest distress. right themselves at the eleventh hour after all. the Queen burst into tears. him for both at the same time. things, which were all perfectly useless.